Pilot your own jet ski over the waters off Orient Bay Beach with this rental. Choose between a 30-minute or 60-minute option, which includes instructions from the rental center staff and personal flotation devices. 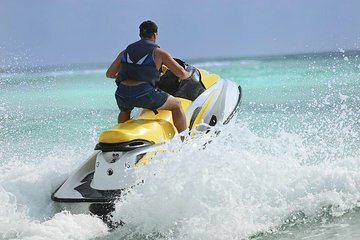 Ride the Yamaha VX 110 on your own or with a friend over the turquoise waters off one of St Maarten's most popular beaches. Ride out to get a close look at the Caye Verte, a tiny islet with crystal clear waters, before returning to the beach to relax and enjoy the rest of your day.